For those who find a spring piston air rifle to be a bit tricky to shoot with accuracy (and a springer does require special techniques) and want something more like a 22 rifle to shoot, there is an alternative. For those of who don't want to invest in all the extra equipment and expense needed to shoot a PCP air rifle, there is an alternative. For those of who want more power and distance than a single stroke pneumatic can offer, there is an alternative. Best of all, this alternative is quite affordable. Here it is. The classic American made pump up air rifle, this one a Benjamin 397P, .177, made in the U.S., vintage 1995. Excellent build quality, too - walnut stock and no plastic, anywhere. I have air guns costing much, much more, but love this one. Really a favorite. Note that this 397P, above, is wearing the excellent Nikon Prostaff EFR 3-9x scope with an AO. It deserves it. As with all of our Benjamin pumpers, 5 shot groups under an inch at 50 yards are doable. In fact, this particular 397P has done closer to half inch at 50 yards and it can do it without any special techniques or fancy support equipment. Surprised? A lot of us who grew up with these pump up air rifles never really gave them the credit they deserved, simply because we never thought to push them out at 50 yards and check accuracy. It's always been there, though. 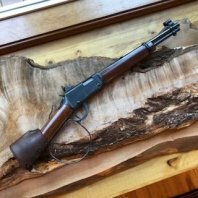 They may be old school, blue collar and low tech by fancy European spring piston gun standards or PCP air rifle standards, but if you think these classic American pumpers can't shoot ... think, again. They also make nice indoor shooters, because you can vary the number of pumps to adjust the power. I use 4 pumps for indoor target work (4 or 5 pumps is the sweet spot for consistent velocity). That puts me around 500 fps. Yup, after shooting my hold and technique finicky springers all week, just loved how easy it was to shoot this target, today. Like I said, pumpers can shoot. Give me some of that old pumper magic, anytime. That takes a lot of concentration to do it ten times. Somewhere around the fourth shot I lose it. How do you do it? Your writing is also on target with a score of 100. Were you ever a school teacher? I learned to shoot using a Crossman .177, Benjamin .22 and a Sheridan .25. In the early 70s I did some damage to the English Sparrow and Rock Dove population of the San Fernando Valley. I really loved that Benjamin. Those are great air rifles. I like mine and shoot them indoors as well. Very nice shooting. Thanks, guys. Glad you enjoyed the post. So many off us grew up with these classic air rifles, but have retired them at some point. Hope my post encourages folks to dust off those old air rifles and take another look at how they can shoot. Ah, consistency! I have a mental routine as far as hold, stance, trigger technique - the whole package - then I practice until all those elements become automatic. That, in turn, allows me to concentrate 100% on the sights/target. Still amazes me how altering any of those elements during a string of ten shots can throw the shot. The key is practice. Takes a lot of shooting to get all those elements to that automatic level and until you do, your sights/target concentration will suffer. That's why air gun shooting is so important for me. I can shoot all I want and whenever I want, right at home, and do it cheap. Loads of fun, to boot. I would not be able to shoot at the level I shoot, now, without the air guns. I mean that. It's why I STRONGLY recommend air gun shooting for anyone who wants to improve their shooting skills. It will make you a better shot. That's a promise. As for the writing, yes, I was a science teacher as well as a professional technical writer at different times in my career. Thank-you for the compliment.